When Google measures the trust of a domain from its backlinks, the search engine actually weighs having a high number of referring domains as a ranking signal. This means that a website with fifty backlinks coming from fifty different domains could be seen as more trustworthy than a website with five hundred backlinks coming from only five domains. So, if you want to increase your SEO with link building, then you will want to gather new links from as many referring domains and IPs as possible. Otherwise, gaining additional links from a website that already links to you will not impact your SEO as much as a new link from a new website. With these two reports, you’ll be able to pinpoint your competitor’s top partnerships that lead to backlinks and find similar opportunities for your website to gain links and boost SEO. Your competitor’s referring domains and IPs will be great reports to discover blogs, media sites, informational portals and geographic areas in your niche that are sending links to websites like yours. In addition to these reports, you may want to take advantage of the Backlink Gap tool to locate referring domains that send backlinks to multiple websites that you compete with. The Referring Domains report will give users a list of every domain that’s linking back to the queried domain. At the top of the report will be a TLD Distribution and Country table showing the most popular TLDs and geographic zones among the domain’s backlinks. Beside each TLD zone is the total number of domains that are linking to the queried domain with that TLD. 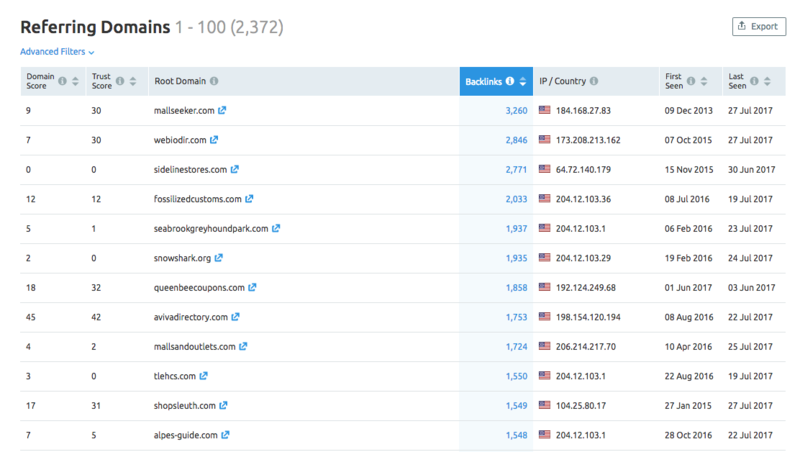 If you click on the number beside one of the TLDs, SEMrush will add a filter to the referring domains report and show you a list of the domains with the corresponding TLD. Use the .edu filter to look for educational partnerships, the .gov filter for governmental partnerships, and .org filter for organizational websites. Commonly, you’ll find information portals and directories that are partial to large databases and lists of websites using a .org TLD. If you click on a the “other” link from the TLD Distribution table, you will open the TLD Distribution report (which does not have a tab in the interface) showing a domain’s complete list of TLDs that it receives backlinks from. From this report, you can click through to see another filtered report with the specific source pages. Below these two preview boxes will be the complete listing of domains SEMrush found linking to the queried domain. The domains will be listed in descending order by the number of backlinks they send to the queried domain. The table can be sorted by total number of backlinks, Domain Score, or Trust Score. Sort by number of backlinks to find your competitor’s most generous partnership, and sort by domain or trust score to find domains that contribute the most valuable links that will make an impact on SEO. You can also sort this table by First Seen and Last Seen date to look for your competitor’s oldest and most recent backlink partners. The IP address and country are listed in this table so you can analyze the popularity of your competitor’s website by geographic region. It’s generally agreed that having a more diverse background of links, compared to a high volume coming from the same IP address and region, will send a stronger trust signal to search engines. The Referring IPs report will provide a table to better analyze the IPs and geographic distribution of backlinks. Advanced filters in this report gives you the option to filter by IP address, Zone (top-level domain), and Country. So if you just want to look at the domains linking to Lids.com from Canada with .org TLDs, simply apply two filters and you’ll receive a modified report. Zone filters are essentially TLD filters, and a Country filter will find all of the referring domains located in a certain country with their various TLDs. Filtering before exporting your data is an excellent way to hone in on a specific range of linking domains to a site that you want to investigate. For example, a zone filter for “.au” could find websites using the .au TLD that are hosted in the United States, while a country filter for “Australia” could find websites in Australia hosted on .com or .org TLDs. The Referring IPs report will show you every IP address of the backlinks to a website. With this information, you will be able to tell how many backlinks are coming from one IP address, and how many are coming from various countries. 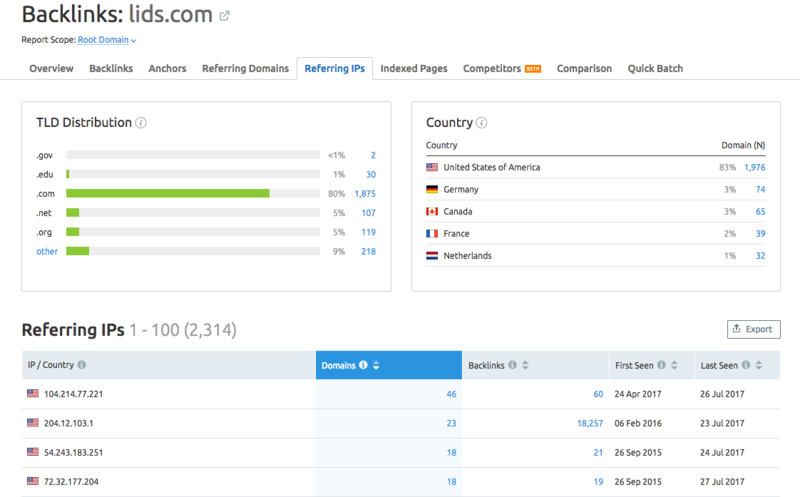 Having a wide spread distribution of backlinks is healthy for SEO, and by using this report you can analyze which countries your site is getting the most links from and where it is most popular. At the top of the report, you’ll see a table for the TLD Distribution and Country, just like the Referring Domains report. Below these charts will be the complete list of IP addresses that are sending backlinks. The IPs in the table are sorted by number of domains on each IP (a single IP can host numerous websites if they are all hosted on the same server) and can also be sorted by number of backlinks to the site, or first and last seen date of the IP. Clicking on a number in the Domains column will take you to a filtered Referring Domains report and clicking on a number in the Backlinks column will take you to a filtered Backlinks report. These reports will provide you with the full listing of referring domains or backlinks that coming from the specified IP address. From there, you can export the list to save your research. One reason for looking into a domain’s referring IPs is looking for a sign of black-hat SEO tactics. If you see a single IP address sending an extremely high number of backlinks from multiple domains, that could be a sign of a private blog network, link network or other fabricated link schemes. This report can be exported to excel, CSV, or CSV semicolon if you want to filter this data on your own.